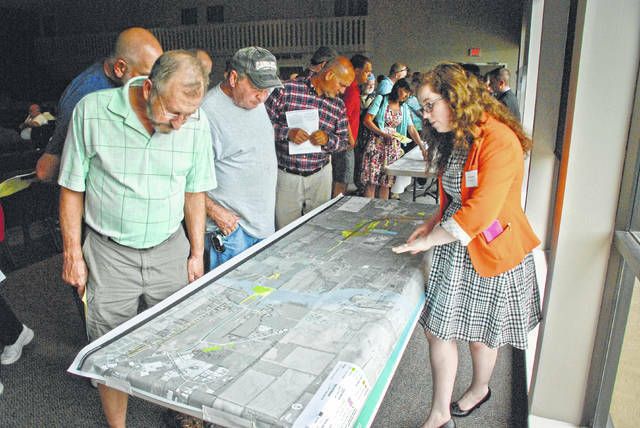 ODOT’s proposed $162 million, multi-phase, I-71 US 36/ State Route 37 interchange improvement project was given a public hearing Tuesday. Before the presentation, an open forum was conducted for the community to view plans and ask questions. As the crowd took interest in one of the large maps, Jennifer Howdyshell of MS Consultants Inc. answered questions. Improvements to the Interstate 71 corridor will be a great benefit for Delaware County. That was the word from Steve Fellenger from the Ohio Department of Transportation during a public hearing Tuesday about the proposed Interstate 71 and U.S. 36/State Route 37 interchange and Sunbury Parkway improvement project. Fellenger, the project manager, said he was excited about the $162 million, multi-phase project during his presentation to community residents who attended the meeting. Fellenger said the project is being driven by safety issues due to traffic congestion during peak times in the area. The existing diamond interchange at I-71 and U.S. 36/SR 37 was constructed over 40 years ago and is the only interstate access in the central and northern part of Delaware County. ODOT initiated a safety study in 2003. The study analyzed the high crash rates around the interchange and recommended modifications to lane configurations at the interchange and access management along U.S. 36/SR 37. ODOT completed a project to address safety issues in 2012. The study emphasized that the solutions are for only the near-term. Addressing the timeline of the project, Fellenger said there has been some concern about it taking 17 years to complete. He said the work will be done in phases. Fellenger said if you are having problems sleeping at night, the 413-page environmental assessment of the project is available on the ODOT website. Nancy Burton, ODOT public information officer, said the public hearing was being held because federal funds are involved in a transportation project. “That is this step in the process,” she said. Burton said the meeting was set up strictly to accept comments only from the public and not as a question/answer forum. During the formal hearing, registered participants were given three minutes to stand and state their comments. The only one to register for comments was Andy Zarins. “My main comment is you should think about lengthening those ramp lanes where you actually got four lanes,” he said. After the meeting, Allen Rothermel, Village of Sunbury administrator, said he thought people were to the point of understanding that the project was going to happen, but still had a lot of unanswered questions about the project. Rothermel said ODOT’s last meeting was more contentious than Tuesday’s hearing. Joe St. John, Village of Sunbury board of zoning, said, the calm of the evening was due to the openness of the meeting and the sharing of material with the public. Comments about the project can be mailed to ODOT and must be postmarked or received by Aug. 11. Send comments to Steve Fellenger, ODOT District 6, 400 E. William St., Delaware, OH 43015. The Environmental Assessment can currently be viewed online www.dot.state.oh.us/districts/d06/projects/71/pages/default.aspx. ODOT held two meetings prior to the Tuesday gathering. The first was in April 2016 to get public feedback on the three alternatives for the project. The second was in the fall of 2016 to share the preferred alternative and project details. This entry was tagged delaware, I-71 US 36/ State Route 37 interchange, ODOT. Bookmark the permalink.